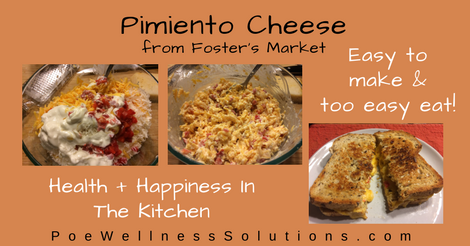 Foster’s Market provides this week’s recipe ~ Pimiento Cheese with Cornbread Toasts. Have you been to Foster’s Market in Durham NC? If you live close by … Go! Visiting? Go! It’s a great experience with amazing food. I used to live in walking distance and you could find me there many mornings enjoying a coffee and a scone. So, good! During the holidays, we discovered our passion for pimiento cheese. When younger, I was not a fan but my adult taste buds feel differently. Looking at the label, I knew we could do better but I was concerned about how labor intensive it would be. Well … simple, simple, simple! Quick and easy to make and very pretty. Also, YUMMY to eat. Several years ago, I discovered grape seed oil mayonnaise. Since then, I have not used regular mayonnaise. No one can tell the difference in flavor or texture but there is a reduction in calories and fat. Also it is vegan, not that it matters in this recipe. Oh, I did not make the Cornbread Toasts. As you can see in the picture above, I opted for a grilled pimiento cheese sandwich. Make it with Foster’s Creamy Tomato Dill Soup. Great for dipping! 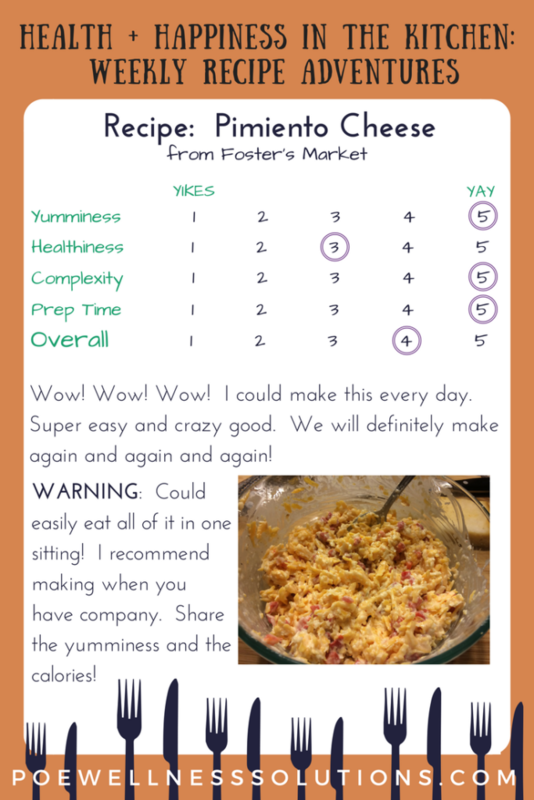 Do you have a recipe to recommend or a story to share? Send it my way. I am excited to try to new things and share here weekly(ish).